Until I started roasting cauliflower, I never tried very hard to grow it. But roasting cauliflower turns this chunky white vegetable into cauliflower candy, sweet and nutty golden brown curds, crispy on the edges and soft in the center tempting me to eat them straight from the pan. Now I pay more attention to how I grow cauliflower. What this advice means for me is that I plant cauliflower seeds indoors in really good potting soil and pamper the little starts from the moment they germinate, keeping the soil evenly moist and the lights close. I sometimes start seeds in one-inch cells and move very young plants to four-inch pots after two weeks, or I plant seeds directly into four-inch pots. With either approach, I make sure the young plants never become pot bound. They are ready to set out in the garden about five weeks after seeding. One more piece of advice for cauliflower growers is to protect the forming curds from the sun because they turn yellow from too much light. 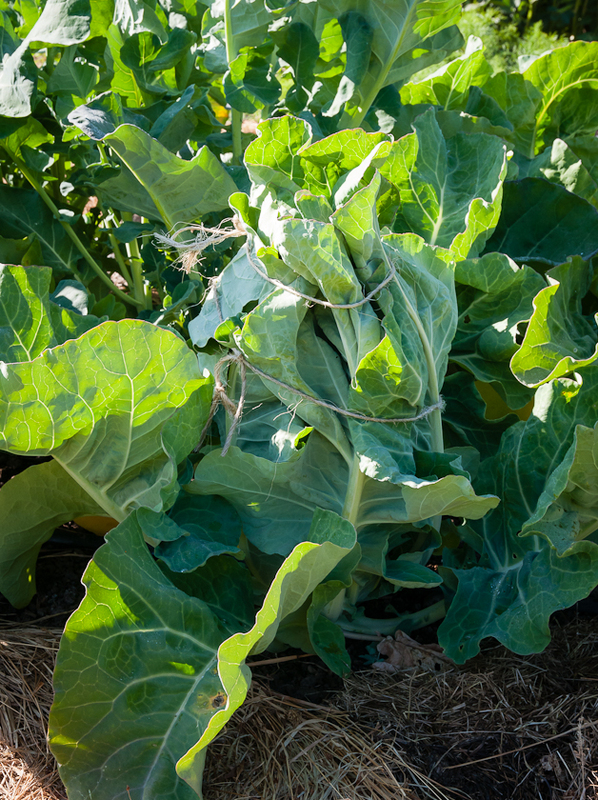 I have memories of my father drawing the big, floppy cauliflower plant leaves up around the growing head and tying them with twine so I do that too once I start to see a cauliflower starting to form. It’s still a little thrill to untie the leaves a week or two later and see a beautifully formed, snowy white cauliflower ready for harvest. I’m getting more successful at cauliflower growing each season. Snow Crown in the variety I’ve been growing the past few years because Fedco says it’s “a cinch to grow.” Once I gain more confidence in my growing techniques, maybe I’ll experiment with other varieties, but for now Snow Crown is great. I seed a half dozen or so in late February for early summer harvest and another six or eight in July for fall and winter harvest. To prepare cauliflower for roasting, I break up or sometimes slice the curds into individual flower pieces a couple of inches long and about an inch across. I try to get them about the same size so they’ll roast evenly. After tossing them in a little olive oil, I spread them on sheet pans, leaving room between the pieces so that they will roast rather than steam, sprinkle with salt and put them in a 375 degree oven. After about fifteen minutes, they begin to caramelize. I check them and turn the pieces over with a spatula so both sides can brown. They are done in another ten or fifteen minutes when they are nicely browned and the edges are crispy. 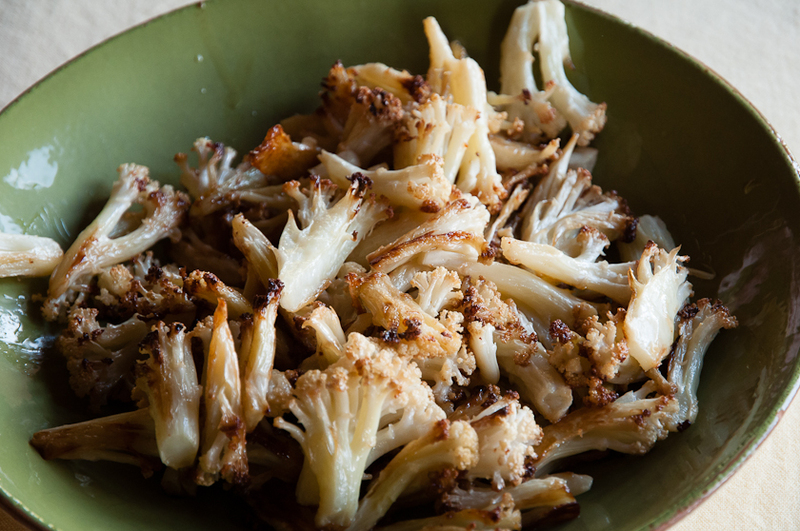 Roasted cauliflower is delicious right off the pan and that’s how I often serve it but it also mixes well with other flavors. 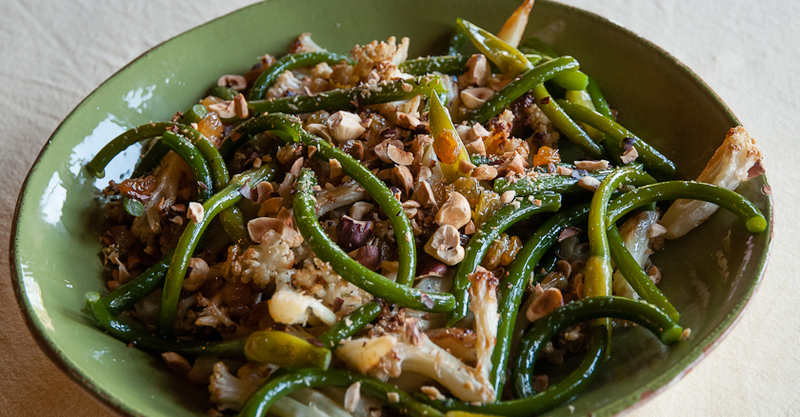 The other night, I had a pile of garlic scapes that I steamed until soft, mixed with yellow raisins and chopped toasted hazelnuts and then tossed over a bowl of roasted cauliflower. The gentle garlic, sweet raisin and rich nut flavors complimented the cauliflower perfectly and we actually managed to get the dish to the table before digging in. There are two more cauliflowers left in the garden. It will be hard to top this last dish, but I’ll try. I’m thinking sugar snap peas and fava beans might be good additions but perhaps it would be best to let these last roasted cauliflowers shine all by themselves. 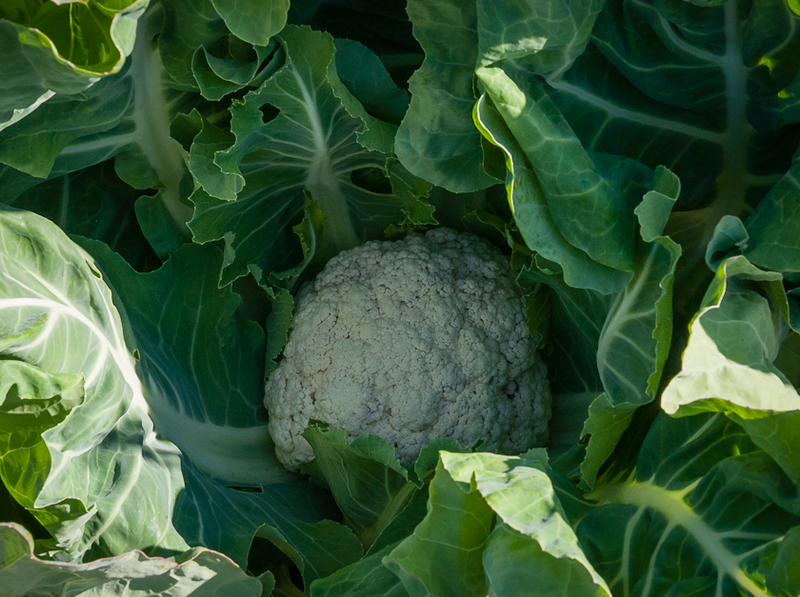 This entry was posted in Fall/Winter Vegetables, Spring Vegetables, Summer Vegetables and tagged Blanching Cauliflower heads, Growing Cauliflower, Roasting Cauliflower, Tips for growing cauliflower by Lopez Island Kitchen Gardens. Bookmark the permalink. Mashed cauliflower is really good too. Just mash it like potatoes…..delicious! Enjoyed this dish last night and can’t believe how good it is. Plan to feature it next week for a dinner party. Thanks again for the inspiration. I love cauliflower candy too! Hard not to eat it all right off the roasting pan! Another scrumptious Debby-dish!! Thank you!